This is our review of the 1903 Lounge in Manchester Airport Terminal 3. 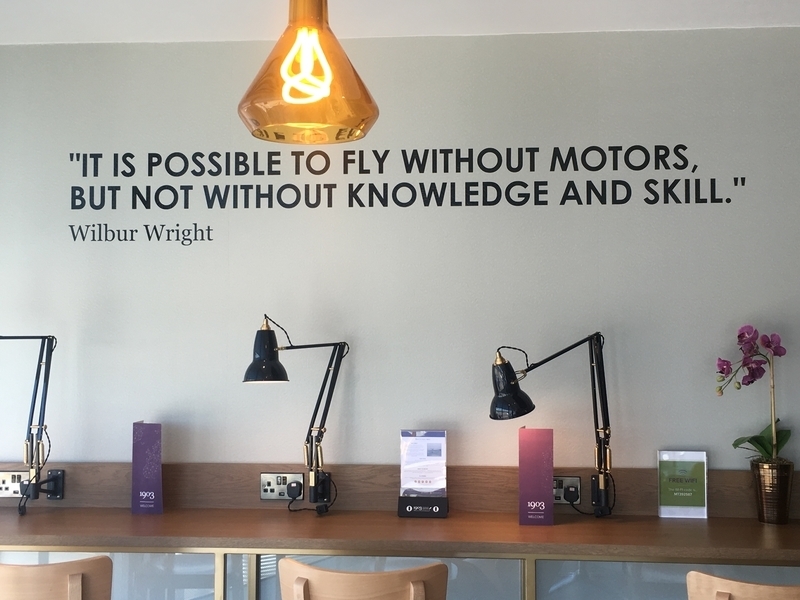 This is, I think, the first review anywhere of the new 1903 Lounge at Manchester Airport. 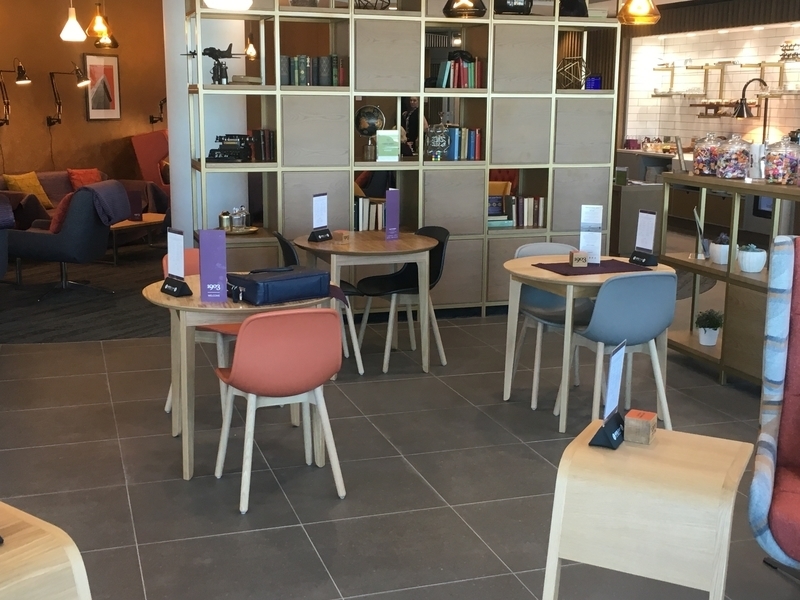 When I heard that Manchester Airport had invested £1.6m in a new ‘adults only’ lounge, with a premium price tag (£35), I decided to take a look. HFP paid its own way – promo code RELAX5 got us in for £30 instead of the usual £35! – and the lounge did not know that I was writing about them. It is also often on Groupon for £28 – see if this link still works. The lounge website is here. 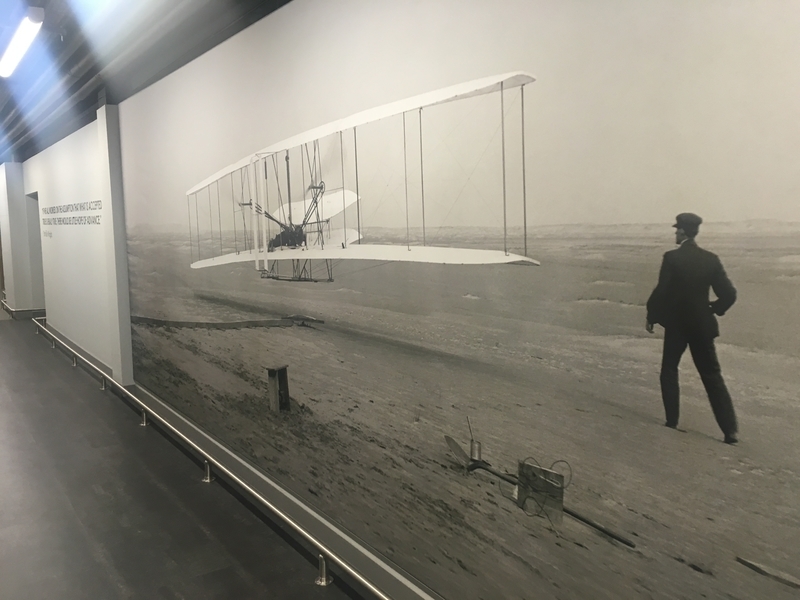 1903, by the way, references the year that the Wright brothers made their first flight. The 1903 Lounge is in Terminal 3 at Manchester Airport, used by British Airways and many other scheduled airlines. It is on the same level as, and only a few paces from, the British Airways Terraces lounge (reviewed here) and the airport-owned Escape lounge (reviewed here). If you have a Priority Pass or Lounge Club (free with Amex Gold) card, you will be using the Escape lounge. I had booked online the day before. If you choose to pay on the door, the fee is £40. Booking in advance also gets you free fast track security. 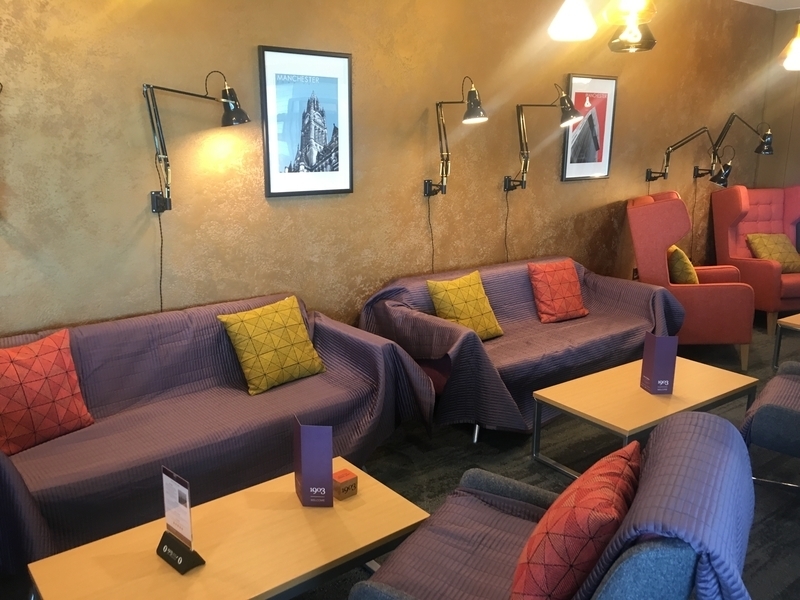 The lounge had around 10 guests when I arrived which – because it is relatively small – made it feel alive but certainly not crowded. Did these people all pay £30-£40? Or is one of the long-haul carriers operating out of Manchester letting its First and/or Business Class passengers use the lounge? If they aren’t, they should be. The staff here are excellent. It was the warmest lounge welcome I have had in a long time (admittedly, if you are only letting in a handful of people an hour you can afford to give them your time). My boarding pass was left on the desk to be looked at later – and was brought back to me at my table – and I was taken on a mini-tour of the lounge. There is, technically, a 2-hour time limit on your visit. However, no-one blinked an eyelid when I handed over a boarding pass for a flight four hours later and I was never asked to move on. …. which was very good. Whilst you can’t see it in the picture, the bread had been lightly toasted which really added to it. It took about 10 minutes for the food to arrive. Throughout my stay, staff were very prompt in removing empty bottles, cups, plates etc from my table as soon as I finished them. Nothing was sitting around for more than a few minutes. 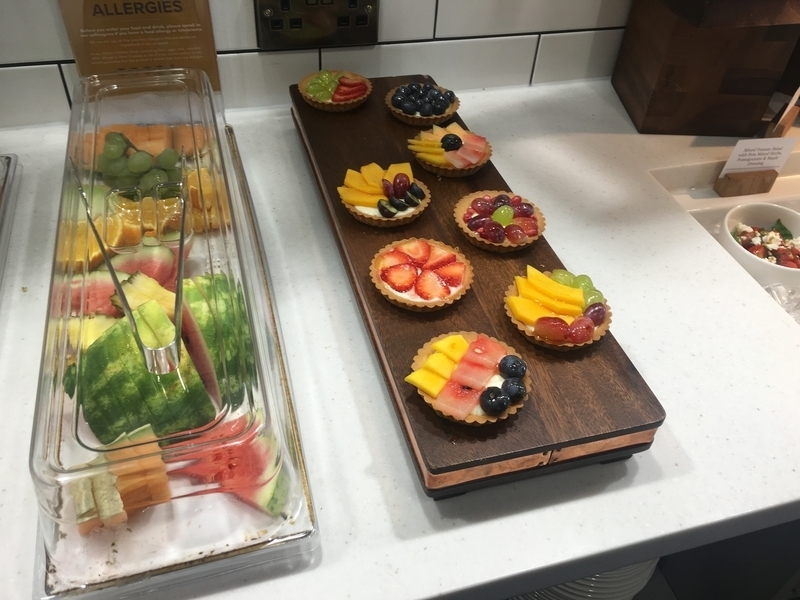 There is also food available on a small buffet. The quality was noticeably higher than your average airport lounge and substantially higher than your typical British Airways lounge. I would place it above No 1 Lounges. 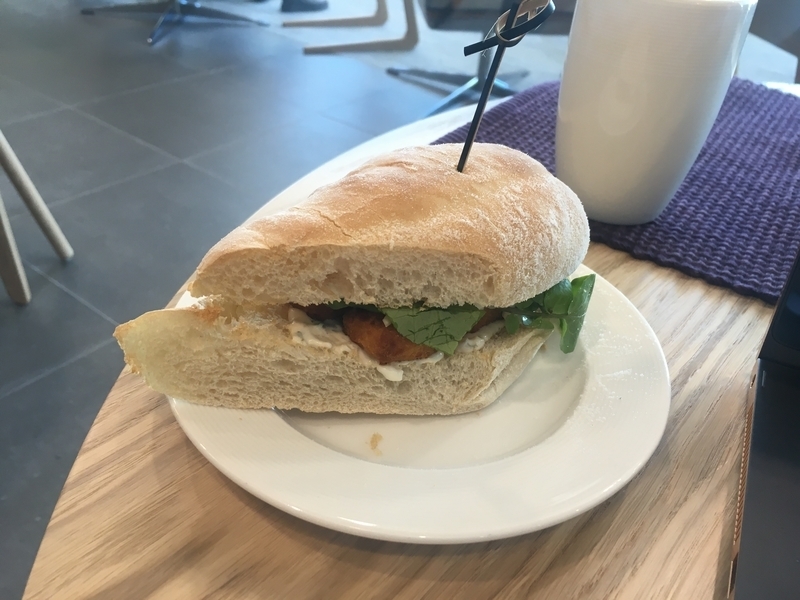 The photographs don’t really do the food justice, but considerably more money had been spent on each item than was strictly necessary, from the salads through the mains and the cakes. 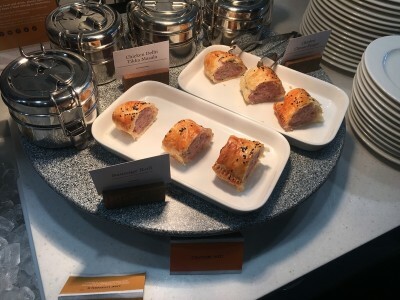 Note that this is not on a par with, say, the amazing Qatar Airways waiter-served restaurant food you get at Heathrow T4 but it is a noticeable step up from anything you will have had before in a mainstream lounge. There are no shortage of drink options. The word ‘champagne’ was optimistically used when I was being shown around, but only prosecco was available. Beers included MPA, Moretti, something branded Marco Pierre White (when did he get into beer?!) and Guiness. Tonic was Fever Tree. Alongside Tanqueray were two different types of Manchester Gin. Other spirits included Baileys, Jamesons, Glenfiddich and Captain Morgan. We’re not in Johnie Walker Blue territory here, by any means, but the addition of local brands was an impressive touch. A dispenser of rhubarb juice, alongside the usual orange and grapefruit, was another sign that things are done a little differently here. I was impressed by the branding across the lounge. 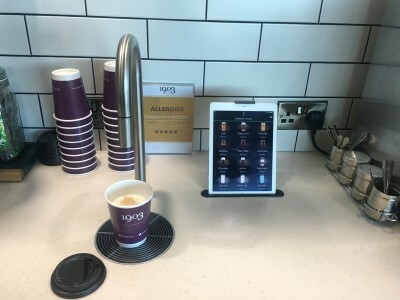 Why does BA use unbranded coffee mugs which look like they came from Ikea, whilst a small one-location airport lounge can have personalised coffee mugs made up? You have probably seen ‘hot taps’ which can dispense boiling water for tea or instant coffee. This system had an entire coffee machine hidden out of sight! There was a tap built into the table top and an iPad alongside showing different drink types. You tap the iPad display button for, say, a cappuccino and it is dispensed from the tap! I found this strangely impressive. There were a lot of novel ideas in this lounge. Some serious thought has gone into the design. The main wall comprises floor to ceiling glass windows. Aircraft gates are directly below you, but you are also looking directly out onto the main runway. 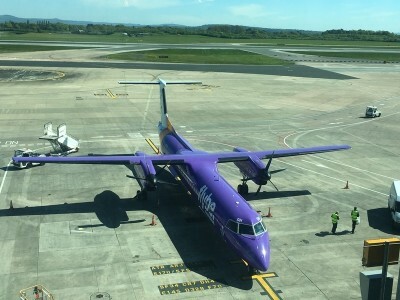 Every time an aircraft landed it would taxi past us on the way to its stand. I’m not a plane spotter in the slightest – I can’t even tell the difference between Boeing and Airbus short-haul planes – but it was still pretty cool to watch. You couldn’t see the aircraft taking off because the lounge is opposite the end of the runway and most aircraft were already up before they reached us. 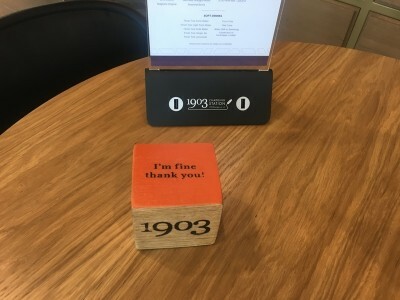 If you want to visit the 1903 Lounge, you are going to have to pay. And if you’ve got children aged under 16, you’re not coming in at all. The lounge doesn’t even allow group bookings for more than four people. Is it worth £35 (£30 in May if you use the RELAX5 code online)? These things are all relative. Manchester’s Terminal 3 is a relatively unpleasant place to hang out. A couple of glasses of prosecco or wine and a light snack in the terminal won’t give you much change from £25 and I’d say the extra £10 to get in here is well spent. If you’ve spent £1,000 on a couple of American Airlines long-haul economy tickets, an extra £60 – £70 to get in here would get your holiday off to a good start. If you’re on a £29 Ryanair flight somewhere then you might find £60 – £70 to use a lounge to be excessive. If you’re looking for bells and whistles such as free spa treatments then you will also be disappointed. However …. if you are the sort of person who is happy to spend money as long as you’re getting a quality product in return, then you will like it here. Remember that I used my own money to get in – this wasn’t a freebie. The views are fantastic, it is a light and airy space, you are unlikely to have more than 15 fellow guests and the quality of the food, drink, staffing and design is first rate. On the way out, I popped into the British Airways Terraces lounge next door. It felt, frankly, dark, depressing and old fashioned compared to 1903. 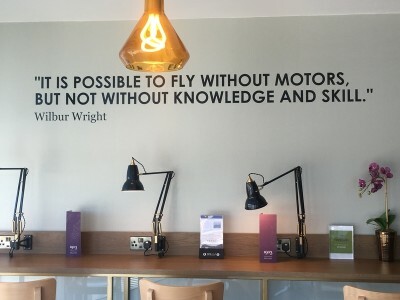 Even if I had free BA lounge access, I would – for a special occasion – pay for 1903 instead. You can book yourself in via the Manchester Airport website here. Remember to check Groupon here (click) to see if it is still listed. The problem with the kids is their parents, every time. But traveling around Europe I encounter very few problems, except once in VIE in the OS lounge where a Russian family managed to empty the lounge and have it to themselves. Me too. Do you think I would be okay leaving mine outside? Agree with this completely, when someone hands me non vintage champagne I throw it back at them with disgust…. I send my butler to have a quiet word with them out back. Then they disappear. I hate the way Champagne is considred better just because it is Champagne. Don’t fall for the marketing. A bad wine made in the champagne region is still a bad champagne even if you get to feel all superior whilst you are drinking it. Might be difficult for an airline to offer this lounge given the age restriction? Sounds great. T3 is always heaving so it would be a good escape for solo travellers and couples. 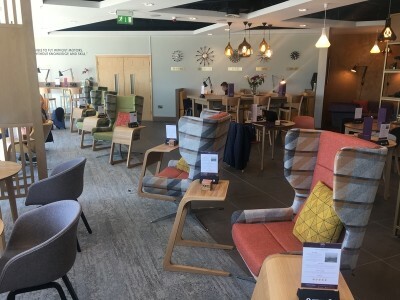 The BA lounge is going to be refurbished according to the BA website which is promoting the various lounge investments, etc. As with many BA investments, I think they mean that the airport wants them in T1 and will pay for a new lounge for them as part of it! I’m in MAN tomorrow (on BA CE via LHR) & now wondering if I should even bother wandering into the BA lounge. It is next to the Priority Pass Escape lounge so it does no harm to pop in! No shortage of newspapers and magazines, a few computers and a decent number of wines to pick from – those are the plus points. OT but any sign of Accor secret deals materialising? I wanted to book a mattress run before the 23rd deadline! After you’ve had a few it is double G,U,I and Es as well. im unlikely to ever visit this lounge being a born and bred southener who gets a nose bleed when i venture beyond birmingham. I’m unlikely to ever visit this lounge being a born and bred Geordie who gets a nose bleed when I venture beyond Newcastle. And a bloody nose when I visit Sunderland. Looks every bit as nice as a mid-level high street cafe. Which isn’t an unreasonable aspiration, so why on earth are so many lounges so dismal? I made the mistake of going into the BA lounge in Munich a month or so back… wow. Some items not as good as last time. In Sep we bought the Patisserie Valerie afternoon tea (with £10 of cakes), cost £35 including 500 clubcard points, this time only 100 points. Yes, this time it is a bit more boring. If you rank the experiences by price you’ll see that the points are strictly awarded by price band (eg £80+ gets you 750 points etc). Last time it was more fluid so you got the odd good offer like that one. It depends, there are a few offers around the £100 mark which attract either 750 or 1000 points. A lot of these are fairly similar so it makes sense to go for the one with the most bonus points. Also there’s a 2 night short break offer for £179 with 1500 bonus points which is an ok deal. Actually I think it might have been as low as £129 but I’d have to check back. 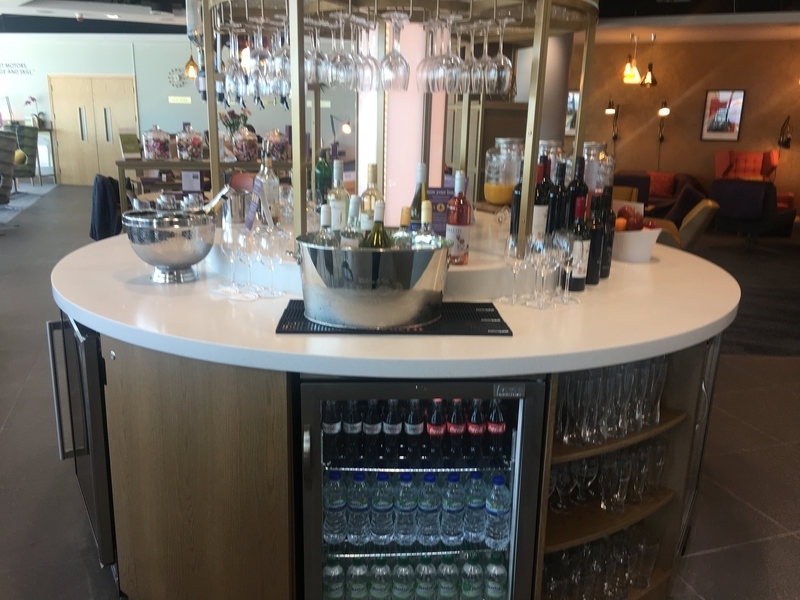 Slightly O/T and as a contrast to that, we recently flew back to London from Rome after a cruise – so delivered to the airport 4 hrs ahead of BA flight, and so vitied the Le Anfore Lounge (FCO) on Amex Gold Lounge pass. However it is In the satellite for gates E, so was a very long walk from main area and still had to take the mini train. Staff on the desk were efficient and helpful, even though fairly busy when we arrived. However very limited toilets, 2 cubicals only plus a shower in each, shock horror – men having to queue!! Reasonable selection of drinks/coffees served at the bar by a very brusque chap, however he did serve everyone quickly and concurrently, you just didn’t dare ask for a bit more hot milk. Food snacks were a selection of sandwiches and pastires, but actually all really tasty. Tables cleared quickly too. Oddly no plugs in main comfortable seating area, but found a few by the small bank of pc’s behind reception. Down on the ground floor so no views either. However there was always the worry about getting back to a main area if the flight is not going from that satellite’s gates (staff advised at least 40 mins) – double check the best route to it, as we could only find a transfer passenger route and had to do the whole security again! At least it meant didn’t need to worry about BA BoB food – as very slow to get even to middle of the plane.